"Show me your gut bacteria and I'll tell you if you're infected with Entamoeba"
One of my 'partners in crime', science reporter Jop de Vrieze, made me aware of a study just published now by Elise R Morton and colleagues. The study appeared in bioRxiv—The Preprint Server for Biology, operated by Cold Spring Harbor Laboratory. The study is totally in line with one of the research foci in our lab. The paper is called 'Variation in rural African gut microbiomes is strongly shaped by parasitism and diet', and can be downloaded here. The backbone in this type of research is the recognition that studies revealing a large contrast between the microbiomes of populations in developing countries and those of populations in urban industrialised areas have shown that geography is an important factor associated with the gut microbiome, but that such studies yet have to disentangle the effects of factors such as climate, diet, host genetics, hygiene and parasitism. It's very refreshing that for once, 'parasitism' is included in such considerations. As mentioned in one or more of my previous blog posts, we have metagenomics data stongly indicating that Blastocystis colonisation is associated with certain microbial communities. As of yet, we have no idea about cause and effet, but the idea alone is immensely intriguing. A large and a small cyst of Entamoeba coli. Courtesy of Dr Marianne Lebbad. Now, Morton et al. have produced data that suggest that the presence of Entamoeba—another gut-associated eukaryotic genus comprising multiple species of varying pathogencitiy—is strongly correlated with microbial composition and diversity. They showed that an individual's liability to being infected by Entamoeba could be predicted with 79% accuracy based on gut microbiome composition. The authors used 16S PCR and Illumina-based sequencing of 16S amplicons, and I could have wished that molecular assays, e.g., the 18S PCR that we have developed in our lab + associated software, had also been used to test the faecal samples from the 64 individuals enrolled in the study in order to obtain more precise data, not only on Entamoeba but also on other human-associated gut protists, such as Blastocystis. While alpha (intra-host) diversity of Entamoeba-positive individuals was significantly higher than that of Entamoeba-negative individuals, analysis of the beta (inter-host) diversity revealed that gut communities across Entamoeba-positive individuals were more similar than across Entamoeba-negative individuals, suggesting that, as alpha diversity increases, there are fewer potential stable states for individual gut communities, or that infection by Entamoeba drives changes in the microbiome that are dominant over other factors. Right—this is Entamoeba, I know, but in principle, the type of analyses that were performed in the present study could be applicable to Blastocystis, Dientamoeba, and other gut parasites, which may help us understand their role in health and disease. Are these parasites able to influence gut microbiota? Can they be used for gut microbiota manipulation? Or do they only infect people with certain microbiota profiles? Time will show... maybe. Are we finally saluting the fungal kingdom as a co-ruler of GI health and disease? The intestinal microbiome—Rosetta Stone or Tower of Babel? Morton ER, Lynch J, Froment A, Lafosse S, Heyer E, Przeworski M, Blekham R, Segurel L.
Variation in rural African gut microbiomes is strongly shaped by parasitism and diet. bioRxiv doi http://dx.doi.org/10.1101/016949 - accessible here. 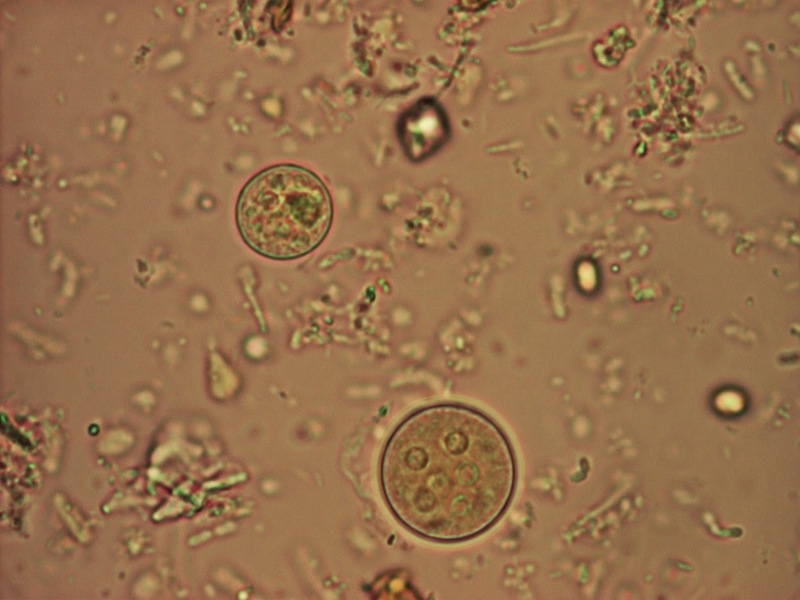 When people have had their stools examined and are told that they have Blastocystis, most of them will not have a clue about what that is. And eventually they'll be told that it's a parasite. A parasite? As in tapeworm? Ok it's not. But then what? As in malaria? Oh... ok, I see... So it's....? Huh? As in ... what??? Now, which are those parasites in and on your body, and what in fact makes a parasite? Depends on who you ask. For parasitologists and public health/clinical microbiologists, a parasite means something along the lines of a eukaryotic organism (i.e. not a bacterium and not a virus) that is not a fungus and that is capable of living and maybe even multiplying on or inside another organism. Some organisms are considered somewhere in between parasites and fungi, such as microsporidia and Pneumocystis. But whether an organism is a fungus or a parasite is not important in most cases. You will also sometimes see that 'parasite' is used as a term meant to cover living organisms causing disease, and in this sense the term may include for instance bacteria and viruses; for instance. A lot of research deals with 'host-parasite' relationships, evolution of virulence and tolerance in parasites and hosts, respectively; also here, bacteria may be referred to as parasites. 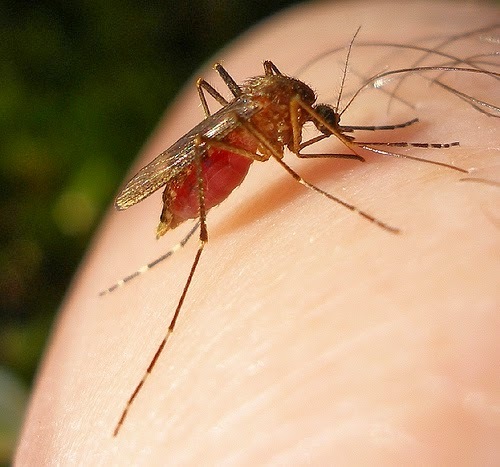 Mosquitos are practically parasites that may transmit other parasites. Source (eyeweed on Flickr). The word 'parasite' stems from Greek, and means something like 'eating beside' or 'eating at someone else's table'. Parasitism is a non-mutual symbiotic relationship where one organism (the parasite) benefits at the expense of another (the host). People like me usually divide parasites (sensu stricto) into protozoa (single-celled) and helminths (multi-cellular; worms). Effectively, this should be protists and helminths, since not all single-celled parasitic eukaryotes are protozoa. Please note that most protists and helminths (the nematode fraction) are free-living, - but some have adapted a parasitic life style and very effectively so. So, when we're told by doctors that we are in fact hosting parasites, - how do we react? I guess some of us will be quite alarmed: Creatures eating defenseless hosts from within, castrating them and turning them into zombies come to our minds, for instance Sacculina, Dicrocoelium, and Leucochloridium, just to mention a few ones (if you're not familiar with these ones, I suggest you look them up - you will hardly believe what they are capable of doing, and despite the horrifying subtlety and cold-bloodedness with which these creatures operate, one can hardly help marveling on how cunningly evolution makes way for some organisms' ability to exploit others). Other parasites are known to cause less spectacular phenotypic changes while having huge consequences for human health and disease: Malaria continues to be a significant cause of morbidity and mortality in many larger regions, and recently, diarrhoea caused by species of Cryptospordium was recognised as one of the most significant health issues in infants and toddlers in select sentinel areas sub-Saharan Africa and South Asia. Some parasites, however, are commensals (ie. they just sit there with a more or less neutral outcome) or even beneficial to the host; for instance, there's evidence of ciliates assisting herbivores in metabolising cellulose. So while, these organisms from one point of view are parasites, the hole symbiotic relationship between these protozoa and herbivores may be seen as mutualistic. Maybe this particular relationship started out as 'parasitsm' but developed into 'mutualism'? There may be a lot more examples of this. Animals usually host various types of parasites, and humans probably used to host a much larger zoo of parasites than many of us do today; what is the public health significance of the recent and rapid 'defaunation' of humans in certain parts of the world? At least technically, Blastocystis is also a parasite: Sitting in the colon, it lives on food delivered by its host, and thereby it certainly eats at someone else's table. Moreover, the parasite is probably not capable of completing its life cycle without a host. But what does it do apart from eating? Does it do us any good just like the ciliates in the herbivores? Blastocystis has co-evolved with humans (and other host species) and maybe humans have learned to exploit Blastocystis so that it's not only Blastocystis exploiting us? Does Blastocystis compete with other organisms in the gut? Does it secrete substances that impact other organisms including the host, and if so, in what way? What's its impact on the immune system? Etc. I guess the take-home message here is that 'parasite' is just a word, - a name for something, and there are examples of parasitism turning into mutualism. Not all parasites induce disease, and parasites are not always organisms that should be sought eradicated.